Hello friends! WOW...it's the last challenge of the month and that means my time as guest designer for the Just Us Girls Challenge has come to an end. I want to thank all the ladies on the design team for making me feel welcome! The challenge this week is an inspiration photo. Creative Nugget: I decided to focus on the bicycles, the color yellow, and the stripes from the photo. 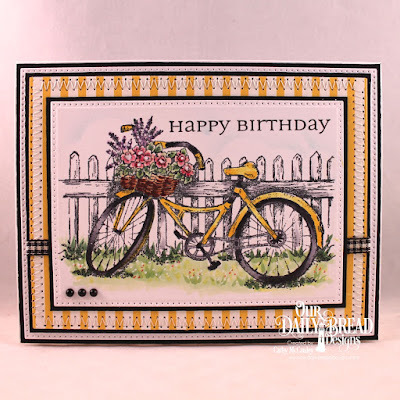 The bicycle image is from the Our Daily Bread Designs Bicycle stamp set and the sentiment from All Occasion Sentiments. The scene was colored with Copic Markers. Be sure to check out all the fabulous inspiration from the Just Us Girls team and come join the challenge...we would love to see what inspires you from the photo! Hello friends! 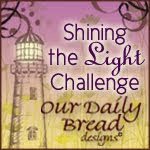 Have you noticed a new feature over at the Our Daily Bread Designs Blog...Two for Tuesday? The idea is to create two cards...one a more simple version and the other a stepped up version. Today I'm sharing my first two submissions for this new feature. 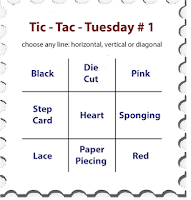 The Just a Note Stamp set was used for the first set of cards. Creative Nugget: The Faithful Fish Pattern Die was used for the background on both cards. Two perpendicular panels were stitched to the front of each card. The note was colored with copic Markers. 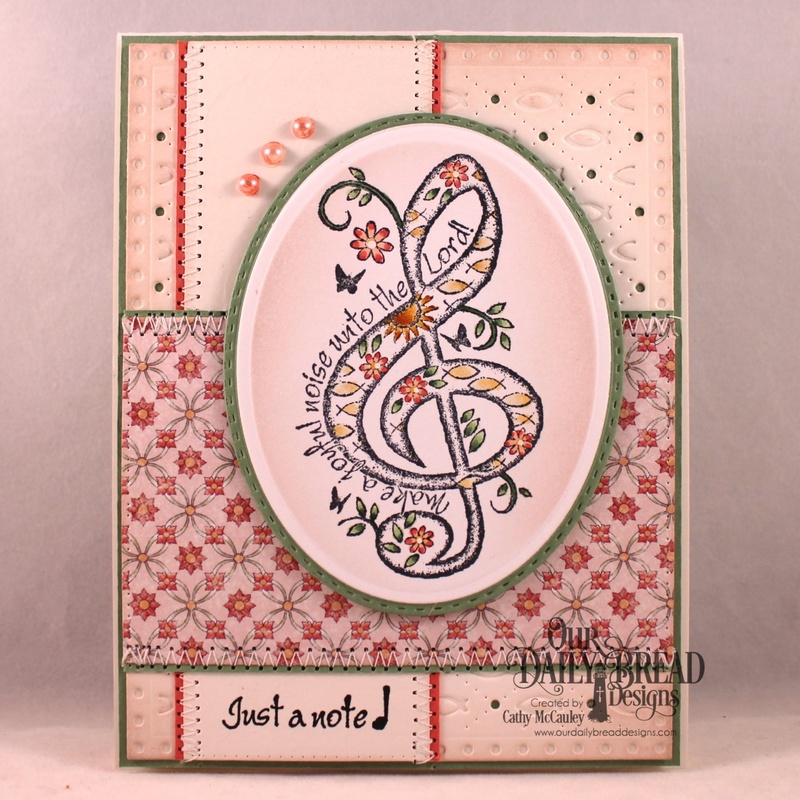 The note was cut with oval dies on the first card, but was framed with the Layered Lacey Ovals Die on the stepped up card. The stepped up card also features Pennant Flags dies for the sentiment. The In My Heart Stamp/Die Duo was used for my second set of cards. Creative Nugget: Copic markers were used to color the hydrangeas on both cards. 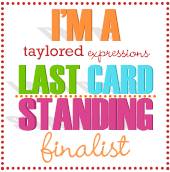 A tag and a lattice background was added to the stepped up card. Sequins were added to both cards. Hello sweet friends! 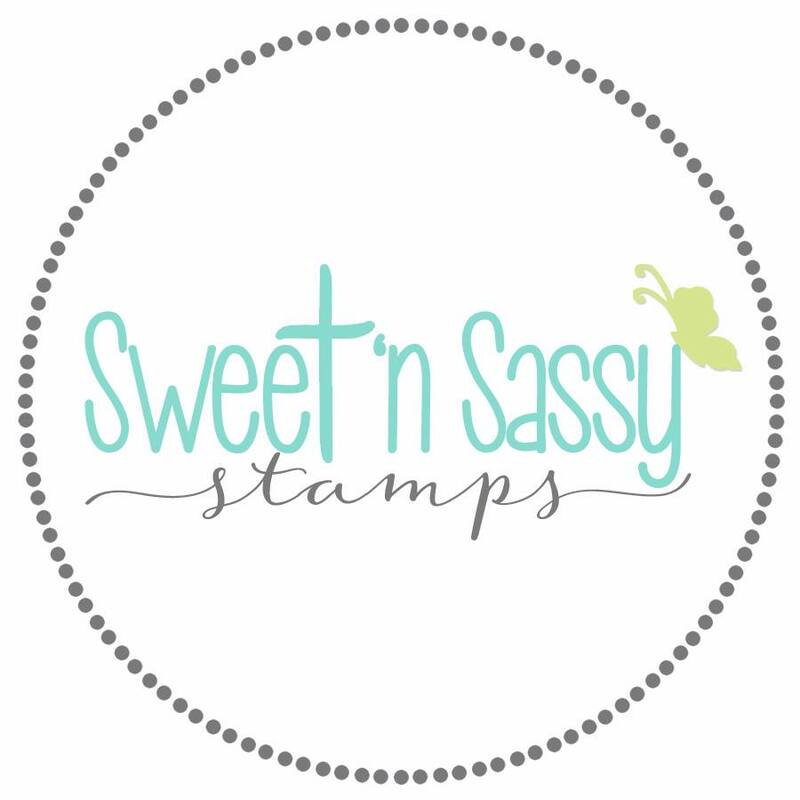 Today I'm sharing two cards over at the Sweet 'n Sassy Stamps Blog. 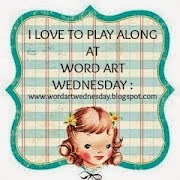 I love the new stamp sets released by Sweet 'n Sassy Stamps this month, but I still love some of the old sets as well. My cards today feature both the new and the old. This first card uses the new Through the Trees stamp set as well as the Scene Silhouettes: Woodland set and the Thoughtful Words set designed by Nina Brackett. 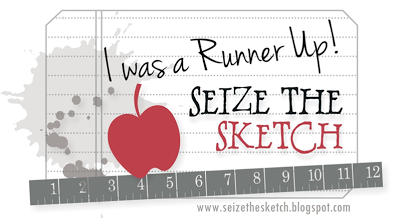 Creative Nugget: The scene was stamped twice with the help of my Misti...once on Neenah card stock and once on mixed media paper. Intense Color Blocks were used to watercolor the mixed media scene and ODBD Pierced Circle Dies were used to cut circles from the top layer. The sentiment from the Thoughtful Words set was embossed on the top layer as well. The top layer was popped over the watercolored layer using foam tape. The animals from the Scene Silhouettes: Woodland set were embossed and cut with my SanNCut. They were also popped onto the card with foam tape. 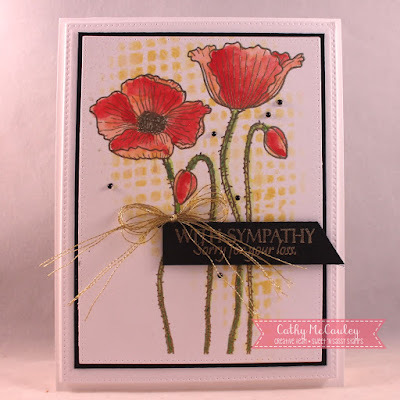 My second card uses the old Precious Poppies and Floral Greetings stamp sets. Unfortunately I needed a sympathy card for a friend who just lost her father and the poppies were perfect. Creative Nugget: The poppies were gold embossed on Neenah card stock and watercolored with Intense Color Blocks. Fossilized Amber Distress Ink was sponged through a TH Burlap Stencil for a little shading behind the flowers. 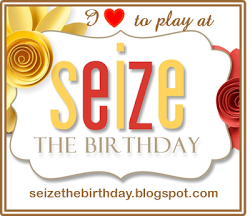 The sentiment is from the Floral Greetings stamp set and was gold embossed on a black banner. A bow made with metallic gold thread and black pearls were added to finish the card. Thanks so much of stopping by! Have a delightful day! Hello friends! WOW! 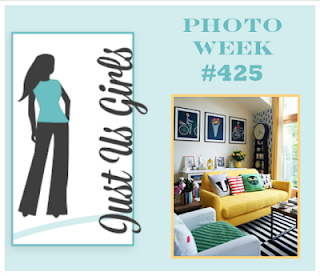 I can hardly believe that this is already week three of my time at the Just Us Girls Challenge Blog. I had a lot of fun with the color challenge this week...you can never have too many birthday cards on hand! 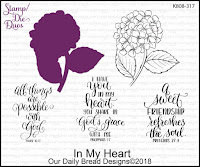 Creative Nugget: Almost all of the sentiments from the Sending My Love Stamp/Die Duo by Our Daily Bread Designs were white embossed on a piece of mixed media card stock. The panel was sponged with Mustard Seed, Carved Pumpkin, and Peacock Feathers Distress Inks, spritzed with water, sprayed with Perfect Pearls for shimmer, and splattered with whit acrylic paint before cutting it with a Pierced Rectangle Die. This panel was mounted on a layer of mustard card stock stamped and white embossed with the Chalkboard Lattice Background. A circle cut with a Pierced Circle Die was sponged and added. 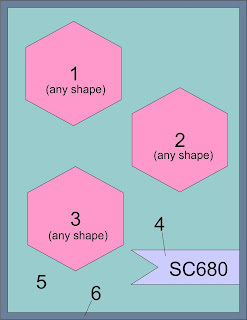 The Sending Die was cut three times and stacked before attaching two Balloons die cuts. Pennant Flags were cut from the three different colors and layered onto the card. The sentiment was white embossed on the teal banner to finish the card. 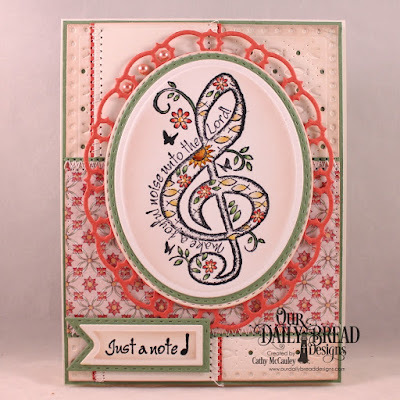 Hop on over to the Just Us Girls Challenge Blog to see all of the inspiration from the fantastic design team and come play along with us this week! Thanks for stopping by and until next time...happy stamping! Hello friends! 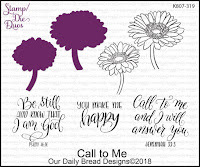 Today we are taking another look at the beautiful Our Daily Bread Designs January 2018 release. 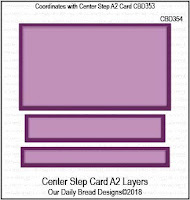 I created a center step card using the new Center Step A2 Card Die and the coordinating Center Step A2 Layers Dies for my sample. Creative Nugget: The card base was cut with the Center Step A2 Card Die and the panels layered with papers from the beautiful new Romantic Roses Paper Pad were cut with the Center Step A2 Layering Dies. 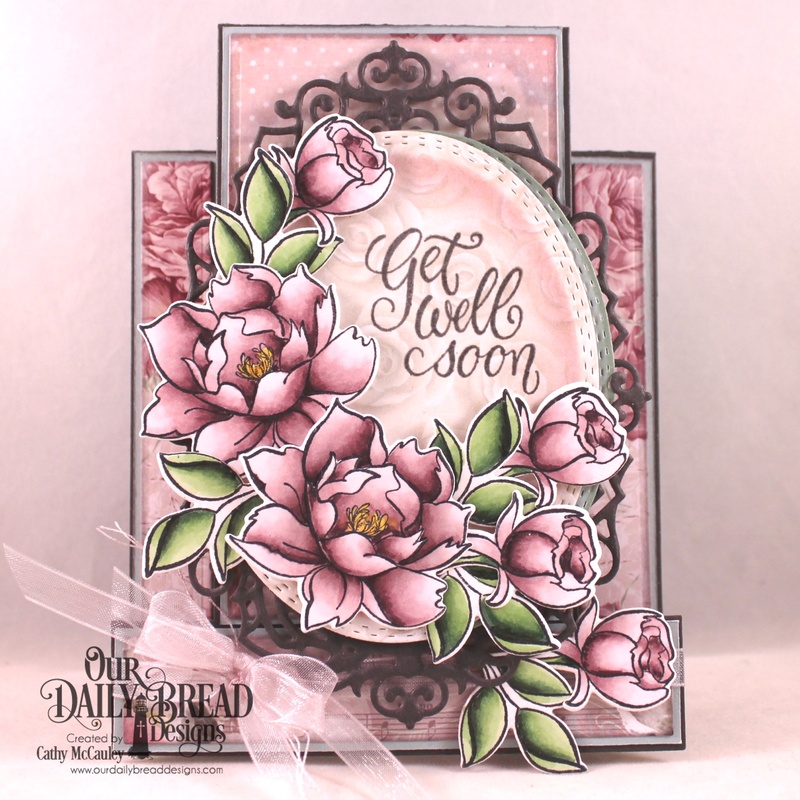 The beautiful peonies are from the new Hello Friend Stamp/Die Duo and were colored with Copic Markers. The sentiment was embossed on an oval panel cut with an Oval Stitched Rows Die and mounted to an Ornate Ovals die cut. The die cut flowers were then arranged around the sentiment with some of them popped up with foam tape for dimension. A sheer bow was added to finish the card. 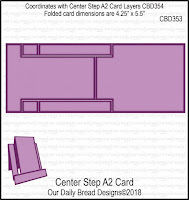 Be sure to check out the Our Daily Bread Designs Blog, Facebook Page, and Instagram to see more beautiful samples created by the Breadbasket Designers using products from the January release. Thanks so much for stopping by today! Have a wonderful weekend! Hello friends....time to move on to Valentine's Day. 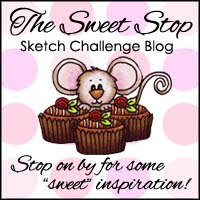 Sweet 'n Sassy Stamps were used to create this card for the Splitcoaststampers Sketch for this week. Creative Nugget: These critters colored with Copic Markers make me smile! Picked Raspberry Oxide ink was rubbed on a texture plate, spritzed with water and embossed on the background. Heart shapes were cut out of the panel so the giraffe from the Stand Tall stamp set and the rabbit and elephant from Valentine Critters could poke through. The back panel was embossed with a hearts embossing folder, the raised hearts rubbed with Fresh Snow ink and then clear embossed. The sentiment was white embossed on a grey banner and a few hearts added to finish the card. 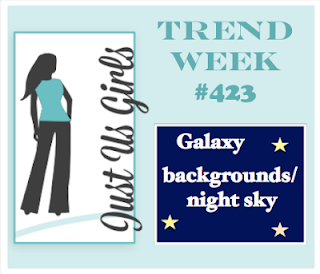 Just Us Girls Trend Week #423 - Galaxy Background/Night SkyHello friends! Hello friends! 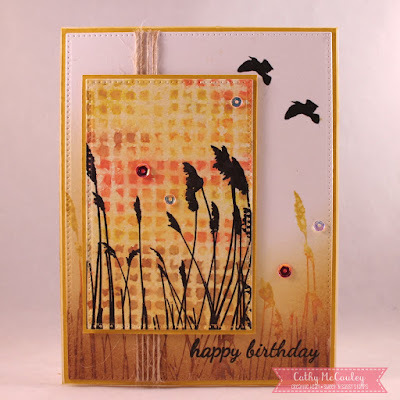 Back again with another card for the Just Us Girls Challenge Blog. This is Trend Week and we are showcasing Galaxy Backgrounds and Night Skies. My sample features new stamps by Sweet 'n Sassy Stamps. Creative Nugget: Blueprint Sketch Distress Ink and Fossilized Amber, Picked Raspberry, Cracked Pistachio, and Wilted Violet Oxide Inks were sponged onto a piece of mixed media card stock. The colors were well blended before Black Soot Oxide Ink was sponged over all of the colors letting some of the color peek through the black. The panel was spritzed with water and sprayed with a mixture of Perfect Pearls. Watered down white acrylic paint was then splattered on creating a night sky full of stars. Spellbinder Dies were used to make an offset frame. Grass from the Scene Silhouettes: Wetland Grass stamp set was stamped on both the frame and the Galaxy panel. The little fox from the Scene Silhouettes: Woodland stamp set was black embossed and cut out with my ScanNCut. 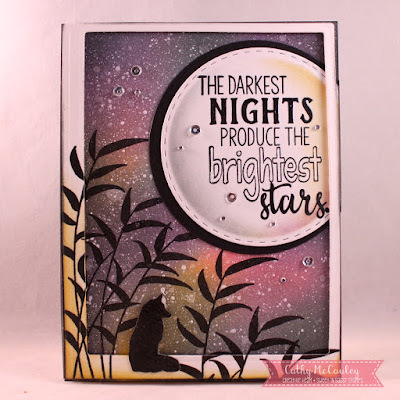 The sentiment is from the Inspirational Word Art 2 stamp set and was black embossed on a circle cut with a Taylored Expressions Stitched Circle Die. A few sparkly gems and sequins were added to the sky to finish the card. 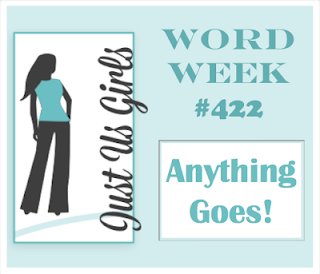 Just Us Girls Trend Week #423 Challenge! Thanks so much for stopping by! 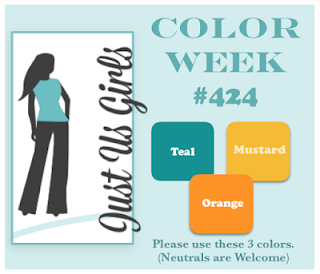 Be sure to stop back again next week for another wonderful Just Us Girls Challenge! Hello friends! 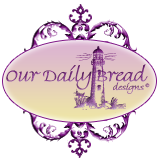 We are in the midst of winter here on the east coast, but flowers are blooming over at Our Daily Bread Designs. Who doesn't love playing with new toys...I had fun coloring this trio of peonies from the new Hello Friend stamp set, and even though it looks and feels like winter outside, this card makes me think of spring! 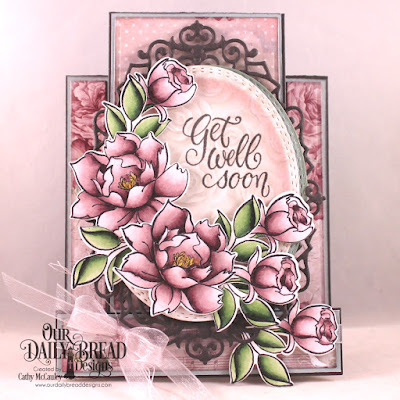 Creative Nugget: The Hello Friend peonies were colored with Copic Markers and cut with the coordinating die. The flowers were mounted to Circles die cuts. 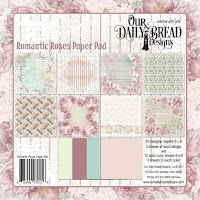 Panels of papers from the Romantic Roses Paper Pad were cut with a Pierced Rectangles Die and stitched together to make a pretty background for the peonies. The sentiment was embossed and an organdy bow added to finish the card. Be sure to pop on over to the Our Daily Bread Designs Blog to see more beautiful flowers in bloom! Creative Nugget: Fossilized Amber and Vintage Photo Oxide Inks were sponged onto a panel of mixed media paper which was cut with a Pierced Rectangle Die by Our Daily Bread Designs. 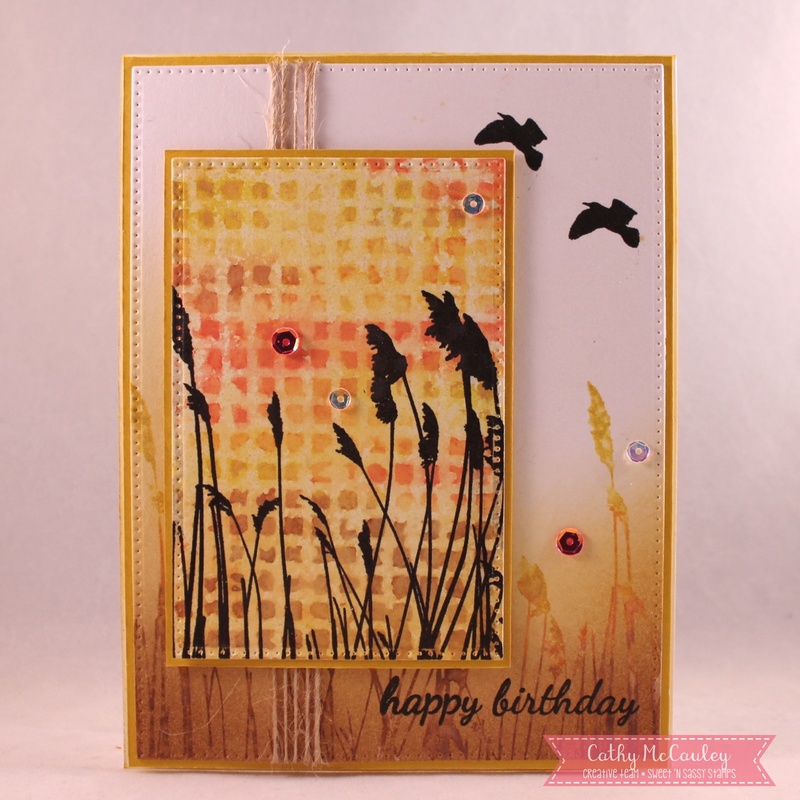 The same inks were applied directly to one of the grass images from a new set by Sweet 'n Sassy Stamps, Scene Silhouettes: Tall Grasses, spritzed with water and stamped over the sponging. The flying birds from the Scene Silhouettes: Woodland stamp set were added to the sky and jute twine was wrapped around the panel. 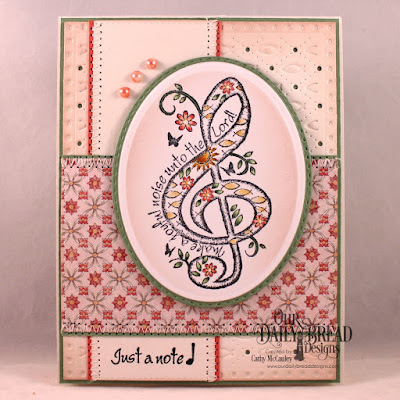 The sentiment from the Keep in Touch, Too stamp set also by Sweet 'n Sassy Stamps was heat embossed on the bottom of the panel before mounting it to the card front. The same oxide inks plus Abandoned Coral were applied directly to the back of a TH embossing folder, spritzed with water and pressed, but not embossed, to another piece of mixed media paper. This was cut with a Pierced Rectangle Die and spritzed with Perfect Pearls to give a little shimmer before stamping the grasses in Jet Black Archival ink. The panel was mounted to the card with Fun Foam and a few sequins added to finish the card. 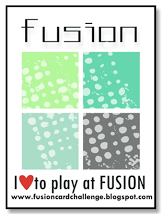 To see more fabulous inspiration from the talented JUGS team, hop on over to the Just Us Girls Blog! Now it's you turn! 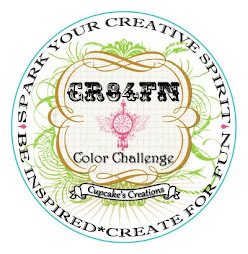 Please join us for JUGS Challenge #422...can't wait to see your Anything Goes creations! Happy New Year, friends! 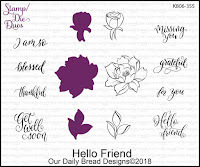 2018 is here and so are new stamps and dies from Our Daily Bread Designs. If you like stamping with flowers, and who doesn't, you will love the new stamp/die duos, the new center step card dies and the gorgeous Romantic Roses Paper Pad being released today. 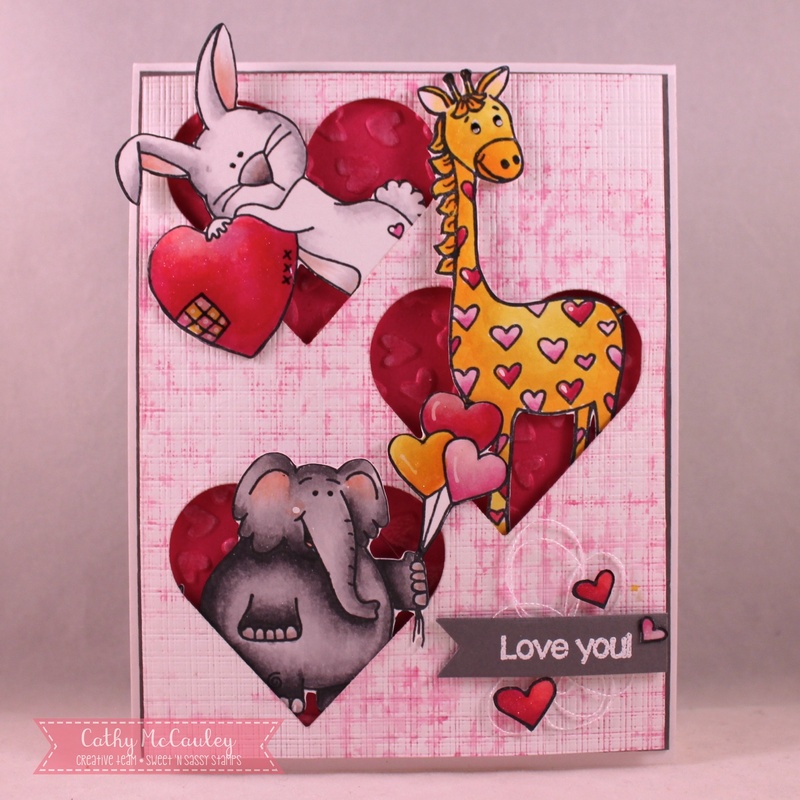 My first sample uses the new Center Step A2 Card and Layering Dies and the In My Heart Stamp/Die Duo. 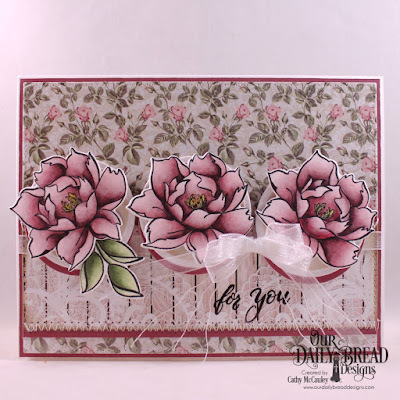 Creative Nugget: The card base was cut with the Center Step A2 Card Die and the panels layered with papers from the beautiful new Romantic Roses Paper Pad cut with the Center Step A2 Layering Dies. The sentiment was embossed on a panel cut with a Squares Die and mounted to a frame cut with one of the Layered Lacey Squares Dies. 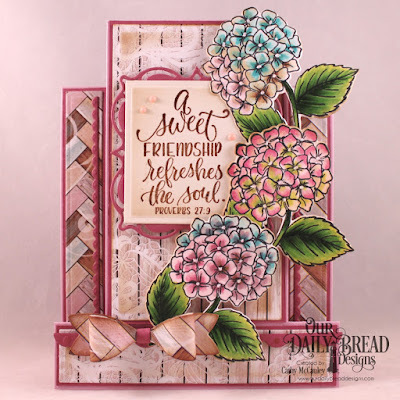 Copic markers were used to color the hydrangeas from the In My Heart Stamp/Die Duo and the coordinating die was used to cut them out before popping them onto the card. Bitty Borders were added to the sides and bottom. The Small Bow Dies were used to cut the pieces for the paper bow. Nuvo Crystal Drops and Wink of Stella were added to the hydrangeas for a bit of sparkle to finish the card. My second card uses the new Call to Me Stamp/Die Duo. 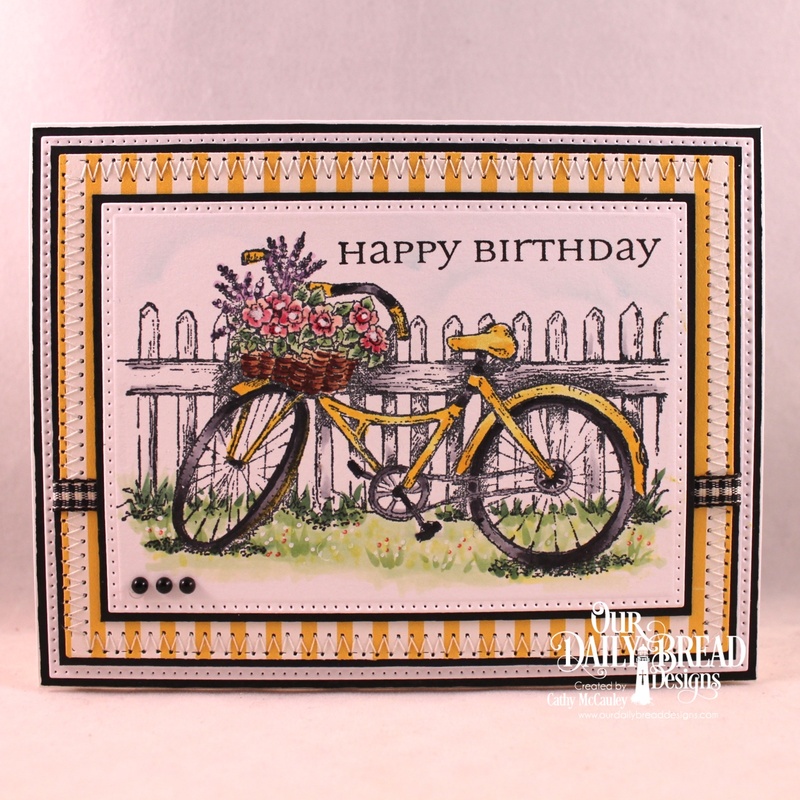 Creative Nugget: The card front was layered with card stock cut with a Pierced Rectangle Die and the Daisy Chain Background Die. Distress inks were lightly sponged on the pierced rectangle layer before popping on the daisy chain layer. The daisies from the Call to Me Stamp Die Duo were randomly stamped on another panel, colored with Copics and stitched to some green card stock. The sentiment was embossed on a Square cut panel, sponged with Distress inks, and framed with green card stock cut with one of the Layered Lacey Squares Dies. One of the daisies was cut with the coordinating die and popped up onto the card. A sheer bow was added to finish the card. Thanks so much for stopping by today and best wishes for a wonderful 2018!